Recognizing how cats and dogs demonstrate stress and anxiety, and eventually fear, is the first piece of the puzzle. 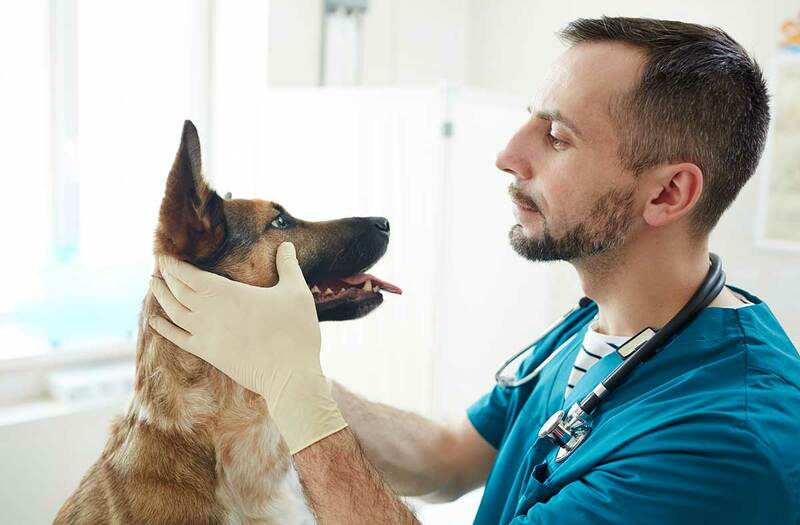 The veterinary response involves how and when we approach our patient in the exam room and how and in what order we touch them. As a profession, we are making progress toward recognizing and treating our patients’ emotional health. We’ve implemented pheromones at home and in our practices, prescribed relaxation medications to give before a visit, added music and new color palettes to exam rooms, and introduced high-reward treats to enhance the patient experience. However, one incredibly important aspect of reducing fear and stress in our patients is the exam room dance, meaning the recognition of our patient’s body language and our immediate non-verbal response. A cat will display anxiety or stress in the exam room differently from a dog, and this fact should be a focus of training. While the subtle dance requires practice and individual adaptation, it carries no material cost and, when done well, can create significant revenue for a hospital through increased compliance. An important goal at every exam is to see a relaxed and happy cat as demonstrated through body posture. When a relaxed cat is sitting or standing, she will hold her ears in a natural, upright position, her tail upright or held out loosely from the body, her eyes will be normal shape, and her mouth will be closed. If the same patient is lying on the exam table or floor, her belly will be exposed and the body stretched out, and her eyes and mouth might be partially to completely closed. 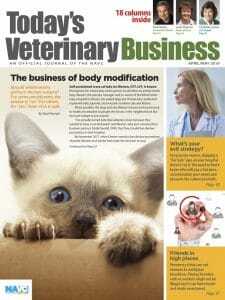 We will start to see body changes when fear, anxiety or stress is triggered in the feline patient. This is an instant signal that our behavior and approach need to change, too. The trigger could be a smell, sight, sound, movement or impatient or overzealous introduction. The patient will start to crouch, her muscles will tense, her tail will tuck tightly into the body, her ears will swivel sideways, the head will lower, the pupils will dilate and she might hide. Ideally, recognition of increased anxiety should instantly signal the need to modify handling and your plan. If your new approach is unsuccessful, the patient will quickly show signs of anger, fear or intense anxiety. If the patient is standing, she will arch her back, position the body sideways with hair raised, her ears will be lowered and held to the side, her mouth will be open with teeth showing, and the tail will be tense. If the cat is lying down, her body and ears will flatten, her pupils will dilate, the tail will be tucked against the body, and her mouth will be open with teeth exposed. Like with a cat, the perfect physical exam for a dog means the canine patient has entered the room relaxed and happy and remains that way. A relaxed dog will have a smooth hair coat, carry the mouth open and relaxed, hold her ears in a natural position, wag her tail and keep her eyes in a normal shape. The patient might even invite play with the rear and tail raised, an interested and relaxed face, and equal weight distribution across all four paws. Any noticeable or subtle trigger might quickly change a dog’s body language. As the anxiety or stress level rises, look for telltale postures. The ears will turn backward, the patient might yawn repeatedly and lick her lips, eye contact might be avoided by turning the head away, and the tail may tuck underneath. As you perfect your body language assessments and responses, specific triggers within the exam room will be easier to identify at this point. This is when you should pause, plan and proceed with a different approach. If you are unsuccessful, the anxiety can change to fear and you might notice more changes in body language. If a fearful canine is standing in your exam room, she will have a stiff body posture and lean forward, her hair will be raised, her ears angled upward, her eyes dilated, enlarged and looking directly at you, her nose wrinkled, and her tail upward and stiff. She might draw back her lips, expose her teeth and growl. If the patient is lying on a nonskid mat on the floor or table, she might cower and her ears will be flat, her teeth exposed and her tail between the legs. Recognizing how cats and dogs demonstrate stress and anxiety, and eventually fear, is the first piece of the puzzle. The veterinary response involves how and when we approach our patient in the exam room and how and in what order we touch them. Our goal is to not add to any stimuli that could be considered confrontational or stressful. When first approaching a patient, eye contact should be avoided and the approach should be parallel to the patient. Physical contact is initiated on the least stressful part of the body, typically the shoulders or neck. The exception would be if the patient presented with shoulder or neck pain. Once physical contact is made, the goal should be to continue the contact for the entirety of the exam. The exam continues from the least stressful aspects to the most, moving from the shoulders down the spine to the abdomen, then examining the caudal aspect and tail, moving to the feet, and then the face, eyes, ears and teeth. Equally important to the examination order is the style of touch and the control of the patient. Each time we must make sure we are reinforcing positive behavior through the use of high-reward treats or other actions. The patient should feel well-supported on either a non-skid mat or when wrapped in a warm towel. A dog or cat that struggles at any time for more than a few moments is signaling a high level of fear or anxiety. The team should pause and change plans. For cats specifically, allow the patient to hide if she desires, and do not scruff the neck. Many alternatives exist for low-stress handling techniques. Mastering body language recognition, planning the order of the physical exam and knowing when to pause, reflect and change plans are the keys to being able to perform a thorough exam, carry out diagnostics, and build rapport and trust with the client. This last point is absolutely crucial to the success of an animal hospital. Clients are more likely to agree to thorough diagnostics and be more compliant when they see a relaxed, happy family member. The patient will have enjoyed the visit and allowed all body parts to be manipulated. These clients are your best source of referrals and positive online reviews. A client who is relaxed because the patient is relaxed will be more attentive to recommendations and discussions. Your mastering of body language will help create the best experience for the entire family. Fearless columnist Dr. Natalie Marks is co-owner of Blum Animal Hospital in Chicago. She is Fear Free certified.